Carlingford Priory, popularly referred to as an abbey, is said to owe its origins to Richard de Burgo, who in 1305 invited the Dominican Order to establish a priory in the town. 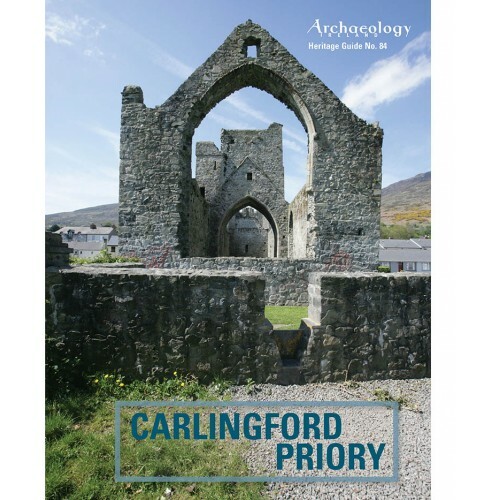 The Irish Historic Towns Atlas records, however, that the Dominican priory was endowed by the merchants of Carlingford in 1352. The priory, dedicated to St Malachy, was established along the general plans for such institutions across Europe: a church, a cloister and domestic buildings such as dormitories, kitchen and refectory. It is likely that the nearby watermill (in ruins) to the east and the mill-race that flows alongside the priory also date from this period. The site is now a National Monument in the ownership of the Minister for Culture, Heritage and the Gaeltacht (Nat. Mon. no. 623). Conservation work was carried out on the buildings, including the laying down of gravel on the floor of the nave and chancel and paved footpaths through the site. There was also some reconstruction of masonry, the reopening of windows and doorways and the delineation of the original walls of the complex. Unfortunately, weathering has deteriorated some of the more ornate features of the stonework, especially the carved head on the outside of the east window.